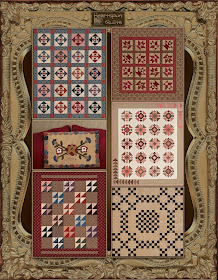 I'm so jazzed to finally be able to share the new quilts I designed using my new On Maple Lake fabric collection! 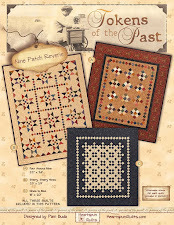 I had a lot of fun designing the three quilts for the new Tokens of the Past: Autumn Sampler pattern. I wanted them to say fall in every way. 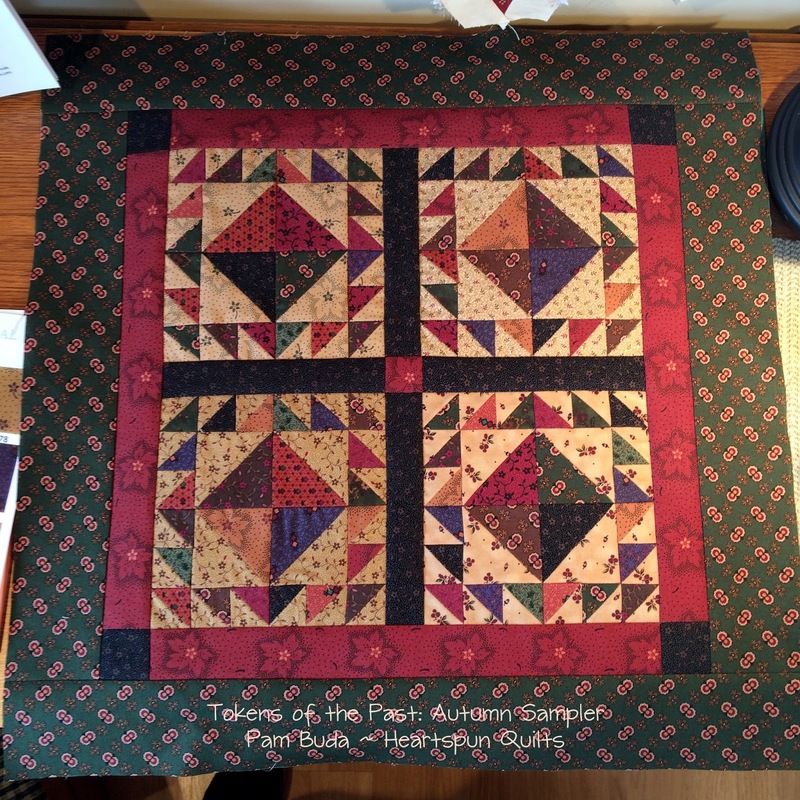 They are all easy to piece, require no special rulers, and all of the blocks for all three quilts come from just one On Maple Lake 10x10 precut! 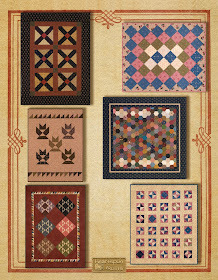 The cover you see above is a draft, and the quilts are EQ images, as I just received my sample yardage late last week. Debbie and I went right to our sewing machines to get started! 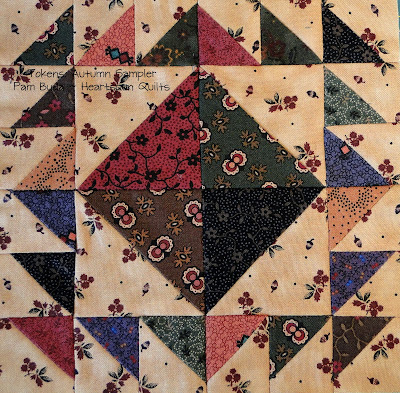 I dug right in to begin making half square triangles for the Colors of Autumn quilt. Here's how the first block looks. I confess I was a bit rusty with my accurate 1/4 inch from not having sewn in so long. (Darn those surgeries anyway...getting in the way of my fun!) 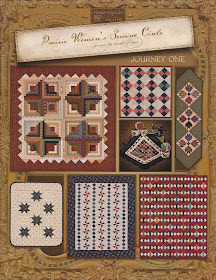 But, by block 2, I was doing much better, and with block 3, I had my piecing mojo back and humming. 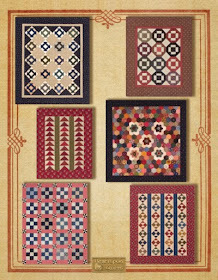 As a fabric designer, you do your best to create fabric patterns and colors that will be not only interesting but harmonious, and while they are pleasing to the eye as a collection, I wonder how they'll turn out when actually pieced into blocks? It's wonderful to sigh relief and satisfaction when you're happy with how all the fabrics have blended to make a colorful feast for your eyes. This happens to all of us as we inspect our units and blocks, check to see if all those points (or almost all!) are just right, and blocks are square and measure what they should. Yes...I was a happy girl! Can't wait to display this cutie on my kitchen table with some acorns, leaves and little pumpkins. 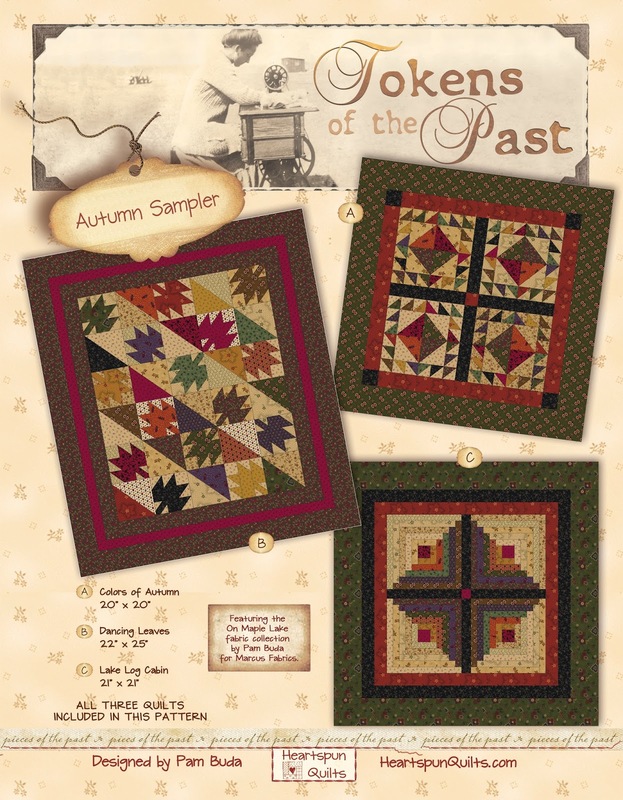 To kick off my celebration of On Maple Lake, I'm offering a special PRE-ORDER promotion on the complete kit for the Tokens of the Past: Autumn Sampler trio!!! and receive the pattern FREE!! The pattern value is $14.50, so you'll be saving quite a bit! Click here to view the details and place your order. Orders will ship in mid-April. Tokens of the Past: Autumn Sampler patterns will be available for individual sale later in March once the quilts have been photographed, and the cover is done. This is a sneak peek at what Debbie is working on. The colors are not accurate as the lighting makes it have a golden overcast to it, but you get the idea. The large quilt is called Autumn on Maple Lake, and if I do say so myself (very humbly!) is just stunning in real life. 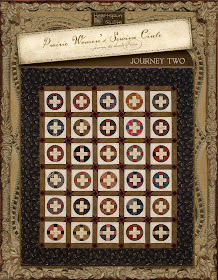 So...more about the large quilt in my next post. Have to admit that I'm anxiously waiting for spring and feel a little weird about talking and working with fall fabrics. But...I'll be so happy come September when they're all ready to use and enjoy.....and you will, too! 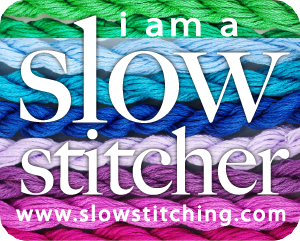 Hope you find peace in stitching today. A new autumnal fabric collection will be arriving at your local quilt shop in just a few weeks!! There are 21 lush, fall colored prints in the On Maple Lake collection. Deep greens, browns, purple, red, autumn gold and burnt orange with a pop of black. 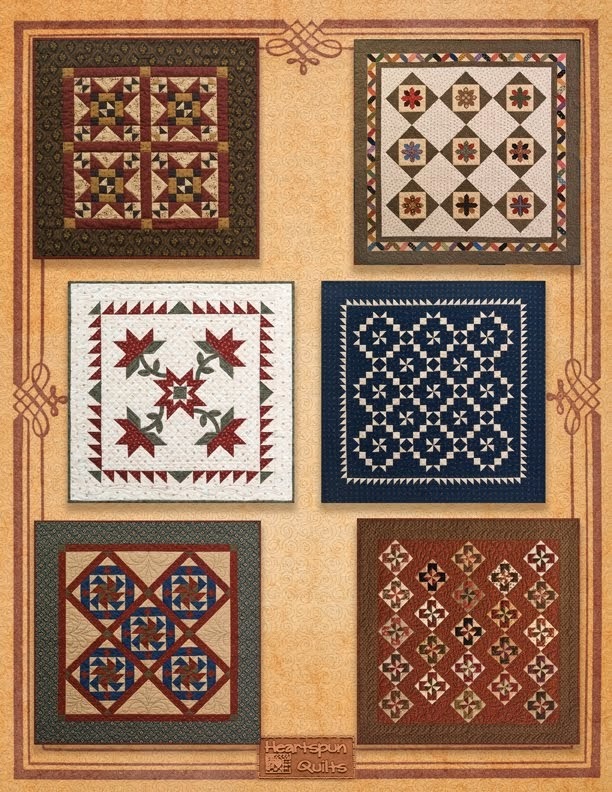 As you can see, a lot of the prints will work well in your everyday quilts. Not all of them are fall themed. I've had such fun playing with these fabrics all week. Looking at the yardage is lovely, of course, but seeing how the prints look when sewn together is way more fun!! I'll show you what I made with these half square triangles in my next post. 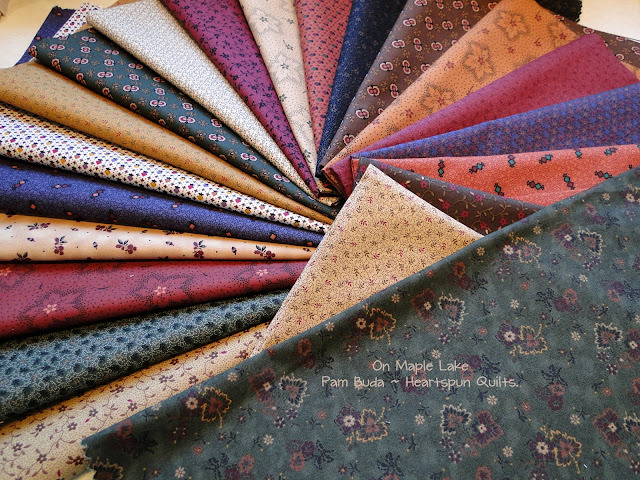 There are four new quilt designs coming soon....all using the On Maple Lake fabrics I designed for, who else? 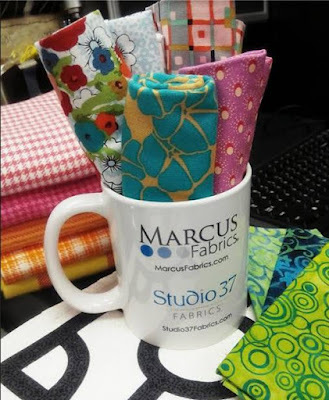 ....Marcus Fabrics! The large feature quilt is called Autumn On Maple Lake. Using the On Maple Lake 10 x 10 precut is a new pattern with three small, fall quilts called Tokens of the Past: Autumn Sampler. Sneak peeks coming in my next post. 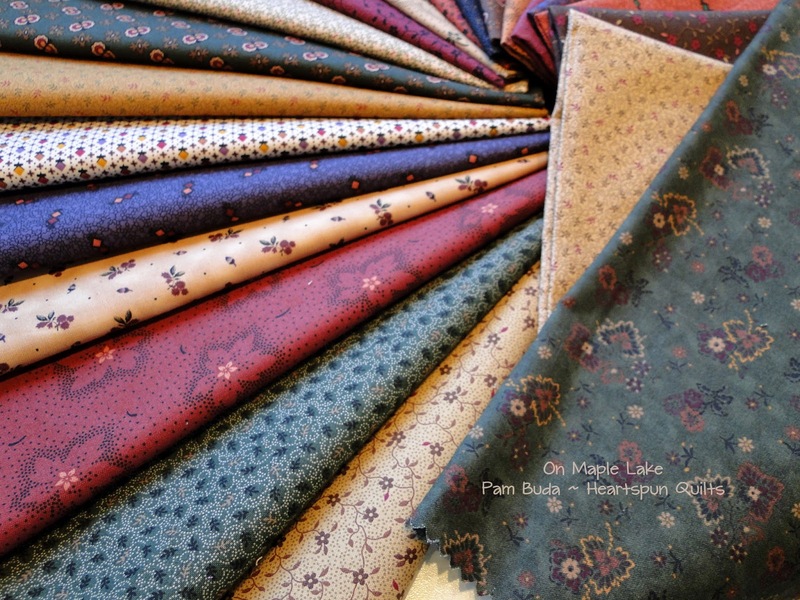 On Maple Lake will be shipping to your local quilt shop in just a few weeks, and we all want to support our local quilt shops! So, please ask for it on your next visit. 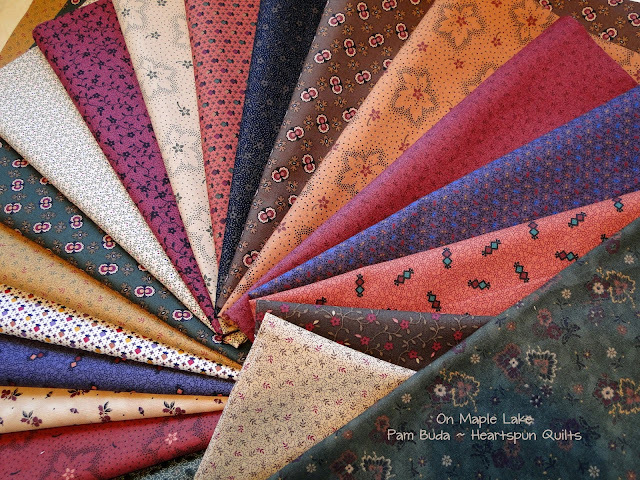 If you can't find it locally, you can order a Fat Quarter Bundle of On Maple Lake from my website. It is normally priced $65 for the complete collection. I'm offering a PRE-ORDER SPECIAL!! 15% off while supplies last, which makes the price $53.55 plus shipping. Click here to order before they're all gone!! Orders will ship in March. P.S. 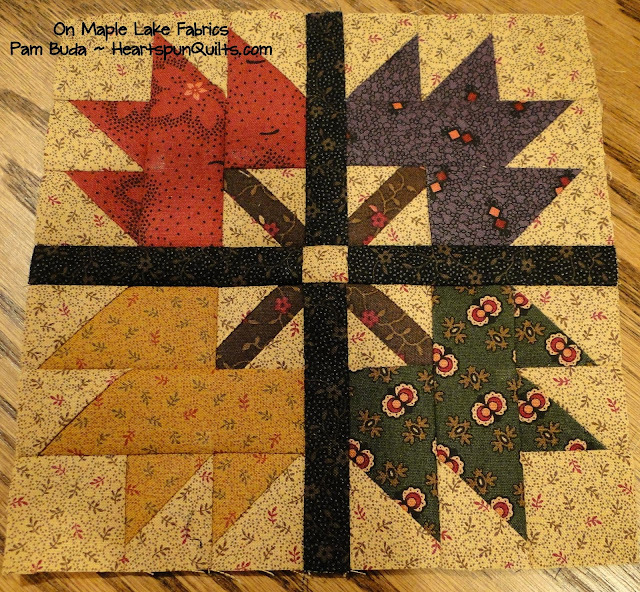 How about making a fall leaf mug rug using a couple of On Maple Lake fabrics? 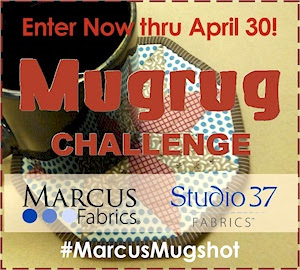 Don't forget to take a quick photo of your mug rugs using Marcus Fabrics, and post them to #MarcusMugShot, or you can email them to Marcus as well!! Let's keep those Mug Rugs going! 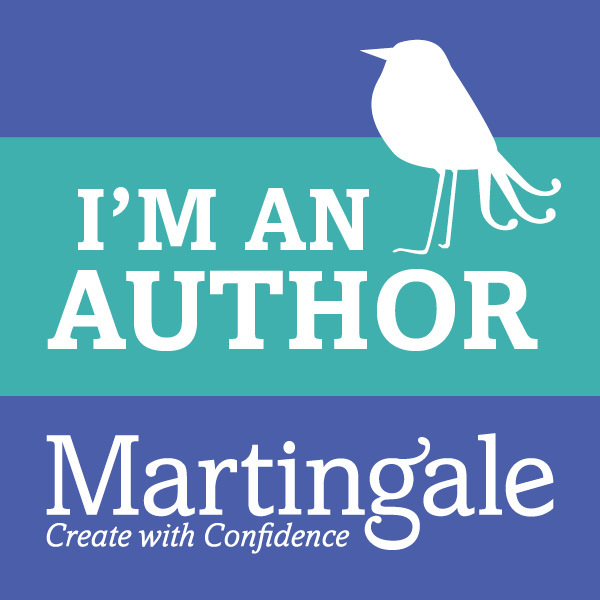 When I knew I had to start dreaming up a design for a mug rug, I wanted very much to do something a little different. 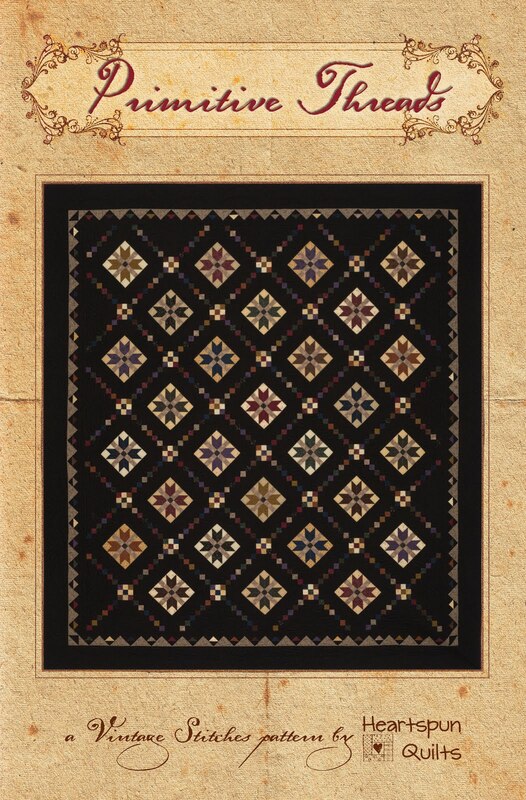 The answer came in a beautiful antique quilt I saw. I love this block for how unusual the star is.....and who doesn't love a star block?! Now, having never made the block before, and with only a photo to go on, I wasn't sure I wanted to commit to making enough for a whole quilt, but playing with the pieces for one block was very do-able. So....I went about figuring out the block components, sizes, fabrics and colors. English Paper Piecing was the way to go and made it super fast as well. I have to say....I am often intrigued by a new block, sometimes intimidated as well. Perhaps it's really hard and beyond my piecing skill set? Maybe requires a new technique I've never tried but would like to? 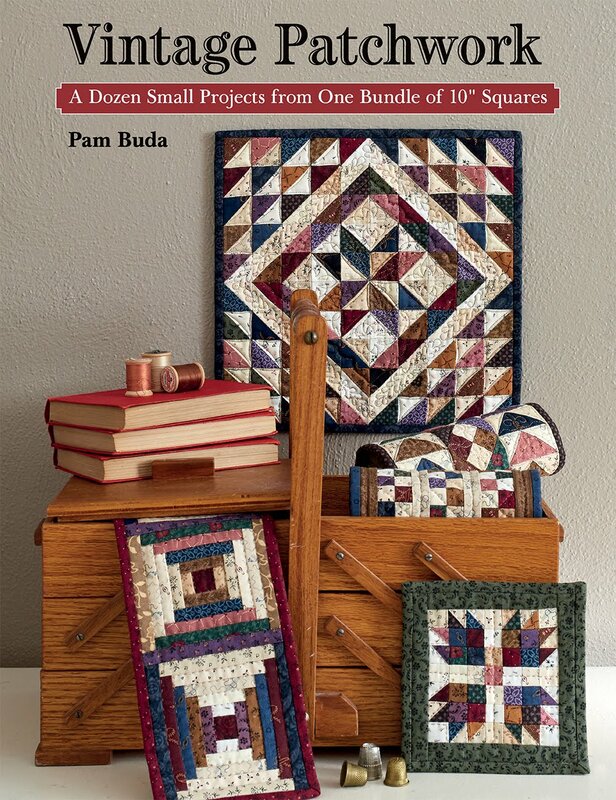 These little micro-mini quilts are the perfect answer! Try that new block or technique ~ make just one block ~ and decide if you want to go further with more blocks and a bigger quilt. 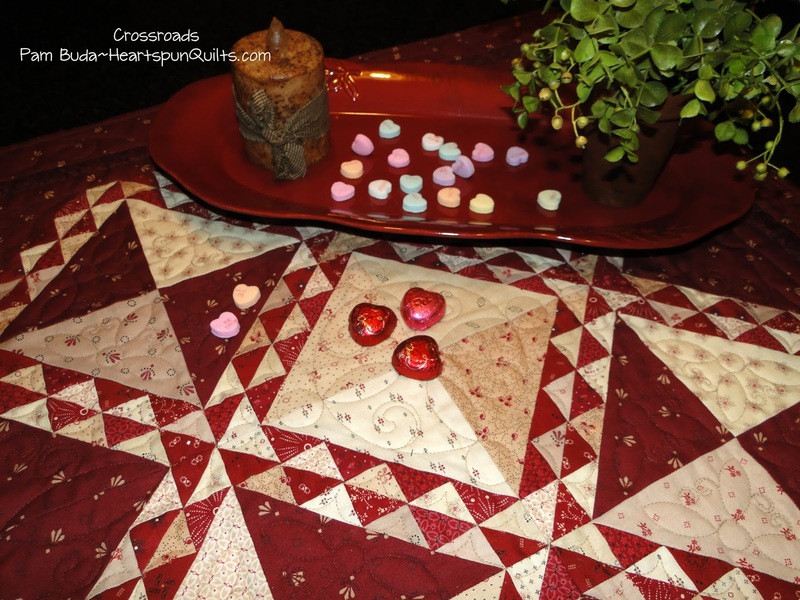 If one block is all that is meant to be, then make it into a mug rug or micro-mini quilt. 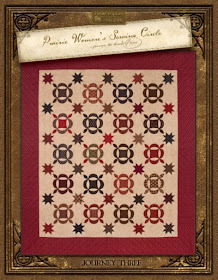 I think these little quilts are very versatile and want lots more of them to decorate with, and tuck here and there. It's a perfect size spilling out of a basket or drawer. As a table topper for a small table or night stand, and can be a welcome addition to a small wall that needs a little something extra. 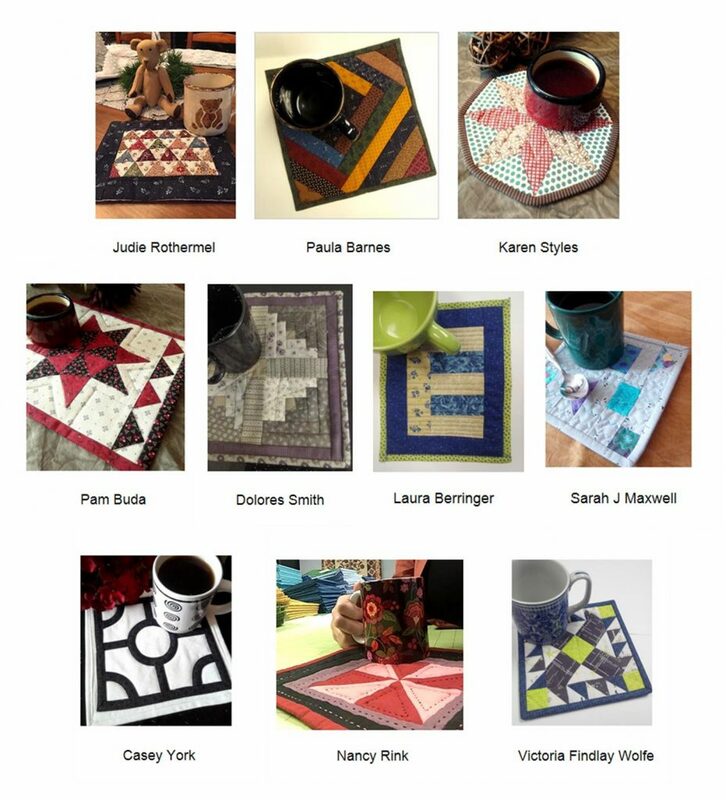 It's a cozy quilt idea for mugs and much more! 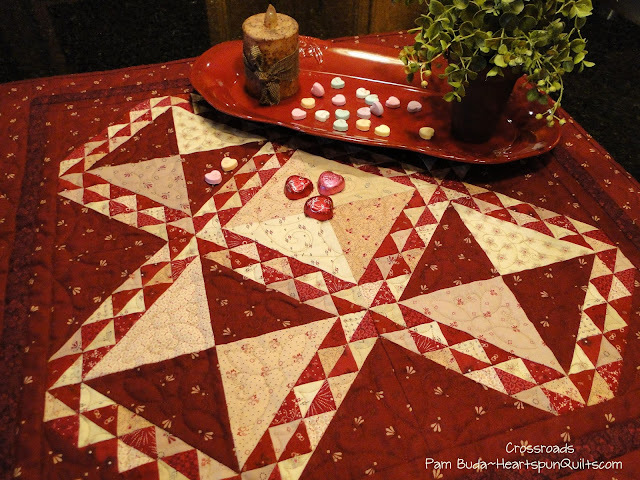 As promised, you can purchase a Sugar Rush quilt kit, complete with the exact fabrics I used from my Conestoga Crossing collection, and includes a 100 ct pack of EPP triangles....all for just $10 postage (within the US) included! If you'd like to make Sugar Rush using your own choice of Marcus Fabrics, you can also buy just the package of Isosceles Triangle papers. My Sugar Rush Mug Rug pattern is FREE! Click here to download the pattern. #MarcusMugShot for a chance to win a weekly prize!! If you're not on Instagram, you can also email your photo as well. Marcus awarded the first prize this week. Check it out on the Marcus Mentions blog. It's easy....so join the fun!! Click here for all the MugShot Challenge details. 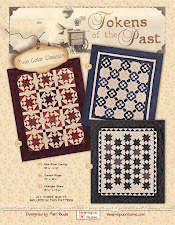 Crossroads ~ A New Limited Edition Quilt Kit & Pattern! I have long loved red and white (not really 'white' but lights) quilts. There's just something about them....or any two color quilt for that matter. 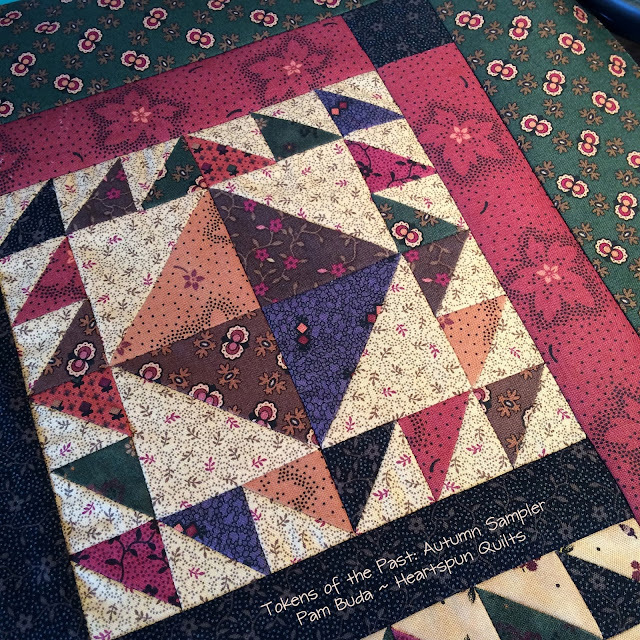 I love this block and the motion it gives a quilt without being all kinds of complicated to piece. The Crossroads quilt is a mix of red fabrics from many of my different collections. A pretty mix of light prints....mostly with a little red in them somewhere. 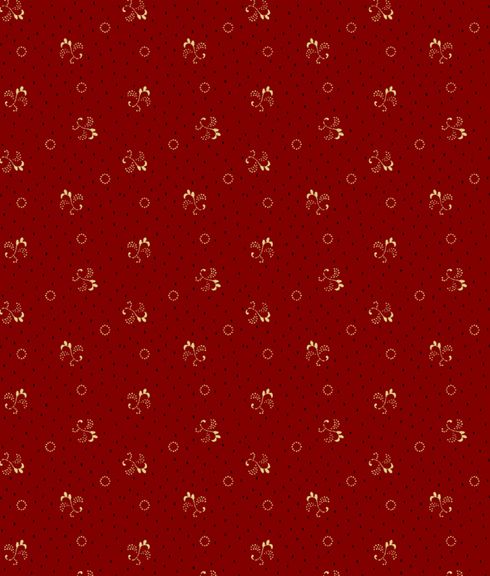 And of course, you have to have a bunch of reds in varying shades of loveliness! Here are all the fabrics in the kit. 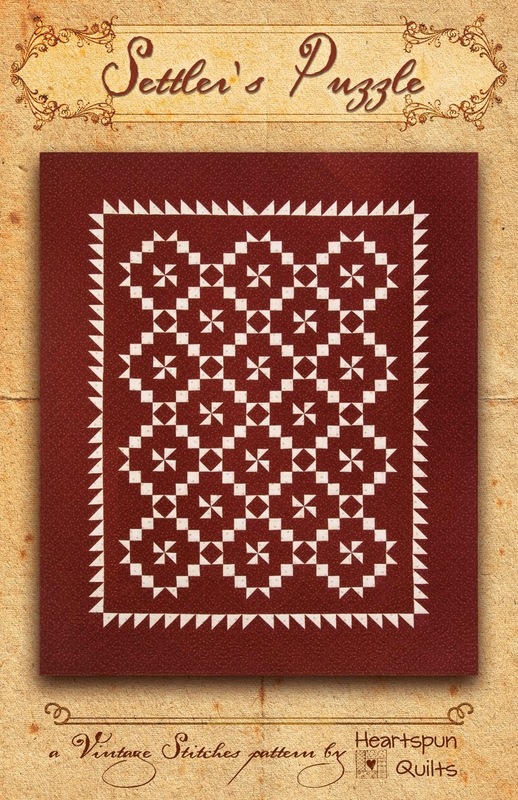 NOTE: There are two different versions of the quilt kit: Version A (which is exactly what you see in the photo above), and Version B featuring the main red print below. The only difference between the versions is the main red print used in the blocks and border. 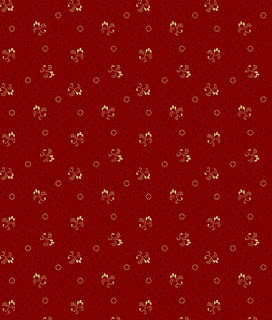 This is the cute red print used in Crossroads Version B. You have choices to make! 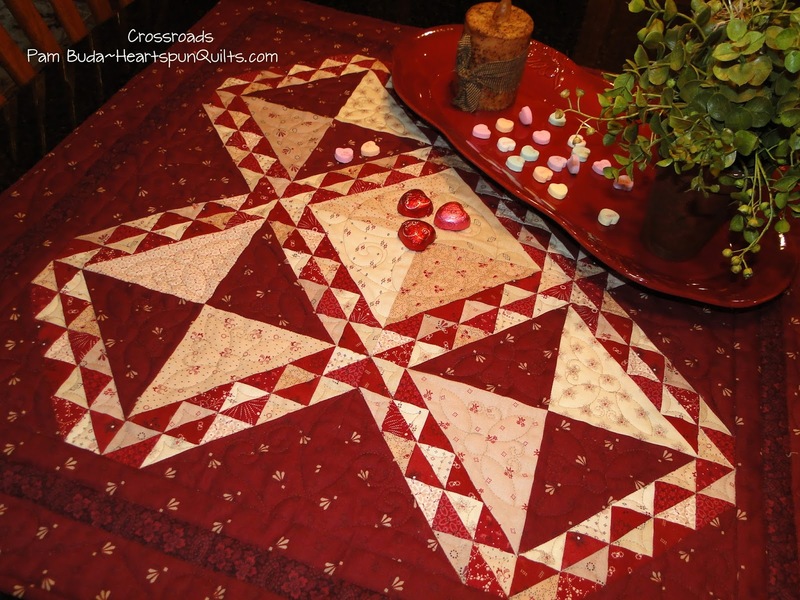 The Crossroads quilt measures 26 x 26 inches. 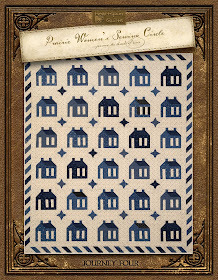 The kit includes all fabrics for the top, binding and backing as well as the pattern. I'm sorry, but the pattern is not available for purchase outside of the kit. The kit price is $45 plus shipping. 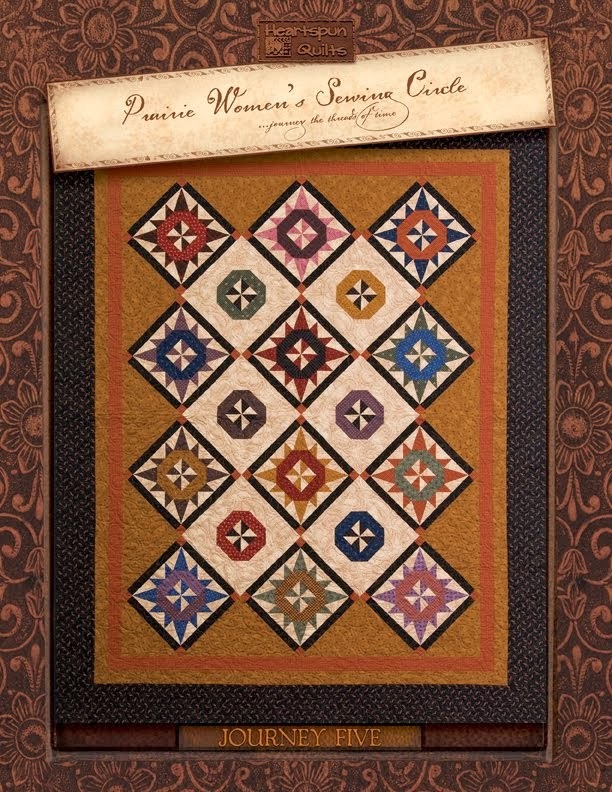 And....this is a Limited Edition quilt offering. Once the kits are gone, they're gone. Click here to order Crossroads Version A.
Click here to order Crossroads Version B. 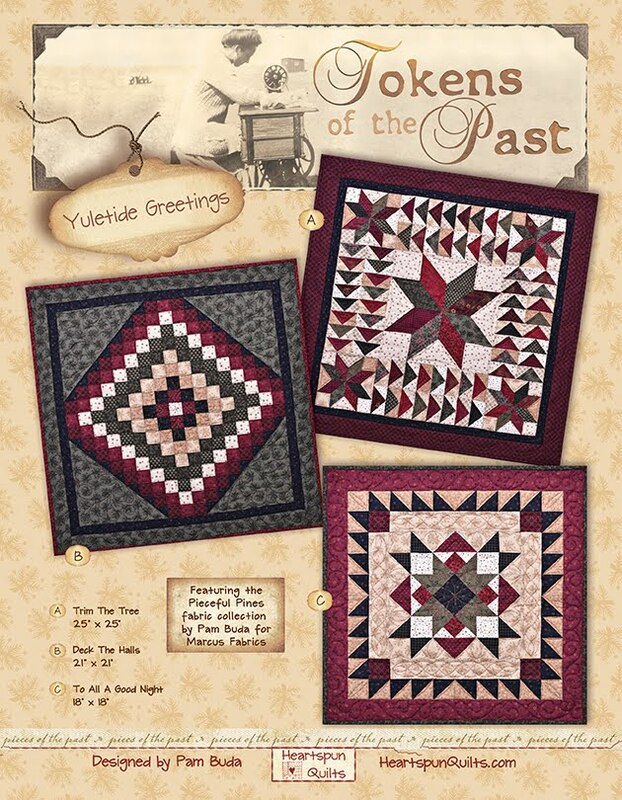 Buying a Crossroads quilt kit would make a very nice gift to someone you love....YOU!